Reflectors are great tools. Unlike flash when you use a reflector you can pre-visualize and adjust the light accordingly, with flash you never know what you’re going to get until after the shot. I sometime use reflectors in the field to make environmental portraits. Often I quickly train my interpreter or my driver where and how to hold the reflector, when I am alone, I ask a bystander to help out….often causing a stampede! 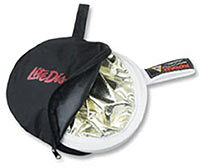 One very popular brand is Photoflex they make reflectors called LiteDisc: I purchased their Gold/White reversible one. As it turned out the gold side was a bit too “warm” and the white side never seemed to be reflective enough for my needs. After extended use, the gold began to flake off, which actually turned out to be a good thing…. the gold side worked better the older it got, but all the gold flakes made a mess every time I opened it. Photoflex now makes a “hounds tooth” pattern gold and white combination, which they call “soft gold”. I would recommend that one over the straight gold which I purchased. 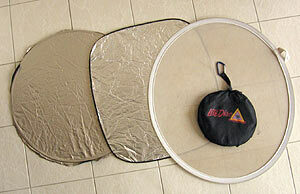 With a quick flick of the wrist the reflectors fold up and can be stored and carried in a small case (shown below). 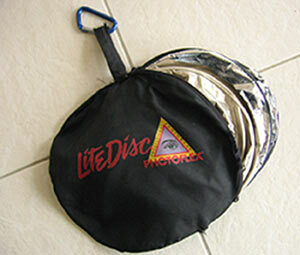 My Litedisc carrying case is a complete mess and I have had to have it sewn back together numerous times (in tiny shops all over the world)…they should make a better quality case. OK, here’s I currently use, and what I suggest you buy unless you own stock in PhotoFlex ….cheap, lightweight, automobile windshield shades: K-Mart, Walmart, drugstores and other discount and automotive stores sell a large variety of these automobile window shades to keep your car cool when it’s parked out in the sun. These shades fold up just like the more expensive “professional” reflectors and if you are lucky you will find them in white, soft white, silver, gold, and shades of light gold. Most often they have one color on one side and another color on the other. Try and get a medium gold on one side and silver on the other. Since they are designed for auto windshields, they generally come as two circles connected by a 12 inch section of fabric. Just cut it down the middle and trim the fabric, and viola…you now have two reflectors! Generally these sell for about $5 to $6. Weekend photographers may laugh at you when you pull them out of your bag, but the results of your photos not your gear is what’s important. Believe me; you can create equally good lighting with both the expensive “professional reflectors” as well as the cheap auto-windshield shades. Since I am always trying to lighten my load, I prefer the auto-shades which are lighter and a tiny bit smaller and lighter than the Light Disk reflector. Besides, they fit more easily in my battered, patched together Lite Disk carrying case which I attach to my belt with a carabiner. One other advantage of the automobile windshield shades is that they are water proof. Unlike my older Lite Disc (which is porous), during monsoon rainstorms in Asia, or those unexpected downpours in Africa, the reflectors come in handy for keeping me and my equipment dry in an emergency.